Making Bold Moves - Creating Multimillion-Dollar Success in 500 Days or Less! ! Making Bold Moves: Creating Multimillion-Dollar Success in 500 Days or Less! is the first in a series of motivational books geared toward inspiring entrepreneurs, business owners, industry executives and anyone dreaming of creating major success in their lives. The book is part “how-to” and part business biography, serving as a “how-about ™,” combining elements of an instructional road map with rich anecdotes about William S. Parrish, Jr.’s real life business journey and personal story. Written against the backdrop of the failure of world economies and the recent recession in the U.S., the reader is taken on a journey through the events that led from NobleStrategy being virtually unknown in mid-2006 to gaining a favorable market position and grossing sales of approximately $1.8 million by the end of 2007. With less than 8% of U.S. businesses grossing over $1 million at all, Bill was convinced that he had a great story to tell. 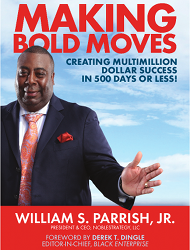 Making Bold Moves: Creating Multimillion-Dollar Success in 500 Days or Less! is comprised of 14 chapters/concepts that NobleStrategy President & CEO William S. Parrish Jr. challenges the reader to digest, embrace and commit to practicing each day for immediate success in his or her life and business. As Bill walks the reader through each chapter/concept, he shares lessons learned and poignant stories about how his concepts created immediate success for NobleStrategy, landing his firm in the center of the highly competitive New York City construction industry in less than 18 months. After being “technically” fired in 2005 from a job where he was making $118,000, Bill went from being a one-man consultancy to establishing a 24-person construction management firm in a very short period of time, through industry alliances and winning a series of high-profile contracts. He has learned valuable lessons along the way and contends that any entrepreneur willing to invest the passion and energy into practicing each chapter in this book can replicate similar success in less than 500 days—if they commit to Making Bold Moves! With an eye-opening and sobering foreword by Derek T. Dingle, Editor-in-Chief of Black Enterprise, the stage is set for Making Bold Moves: Creating Multimillion-Dollar Success in 500 Days or Less! to engage the reader in this real-life account of business and money—a game-changing life plan for anyone looking to immediately create their own version of success.